Details: Mark your calendars! 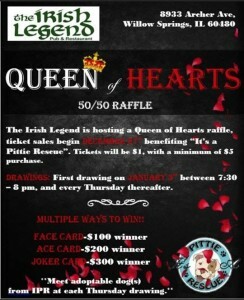 The Irish Legend is graciously hosting a Queen of Hearts raffle benefitting “It’s a Pittie Rescue”! The raffle is a 50/50 raffle. The raffle starts with selling tickets on December 27th and the first drawing is January 3rd. The tickets are $1 a piece with a minimum purchase of 5 tickets. Every week on Thursday a card from a deck of cards (54 total including jokers) is pulled. 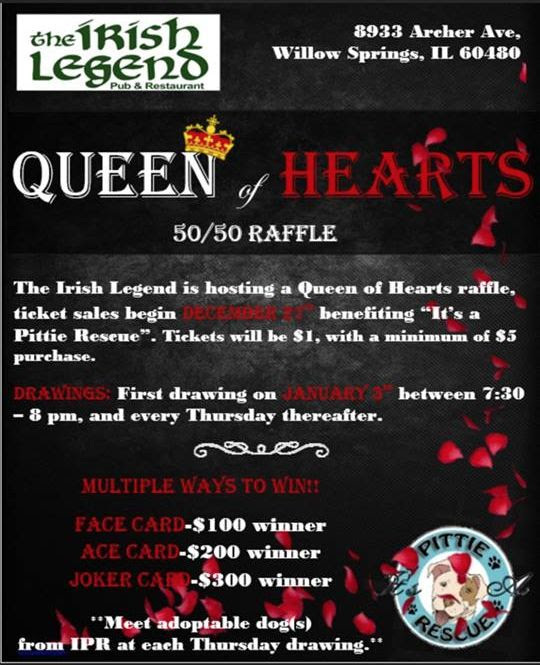 If the queen of hearts is not picked the tickets purchased that week are tossed and new tickets are to be purchased and the pot rolls over. The raffle has a potential of going 54 weeks. Please note that the tickets can only be purchased at Irish Legend. 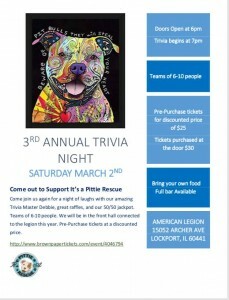 Meet our adoptable dog(s) from IPR at each Thursday drawing! To start the process, please fill out an application on www.rescueapittie.org.